April is my birthday month and I thought I’d make a dream birthday wishlist! (Basically I’ll probably just end up buying myself these things, haha!) First on the list: Charlotte Tilbury’s Matte Revolution Lipstick in Love Liberty. I’ve been dying to get my hands on these lipsticks since they were released in the UK. Now they’re finally available in the States, but unfortunately only for a month which I’m not so excited about. I’ve already purchased two: Red Carpet Red and Glastonberry and my sister has promised me two more: Bond Girl and Walk of Shame. While I’d love to try the entire ten shade range, I’m not sure my bank account would really appreciate it! Then there’s Charlotte’s Dolce Vita Palette. All of the colors are stunning, but it’s the reddish brown shade in the upper right that makes me fall in love with the eyeshadow quad. It’s my favorite color lately and it’s become my go to eye look for most days. If you can’t tell there’s a bit of a Riffle Paper Co. theme here. As you might know, I love a good floral and they always have such beautiful designs! The iPhone case is on the top of my list, I love that it’s a clear and will show whatever color phone you have. (Really what’s the point of wanting the gold phone if you can’t see it!) The London art print is just so cute and would be perfect for the gallery wall I’m hoping to start in my room this summer! The coasters are printed with three of my favorite cities and one I’ve always wanted to visit: London, Paris, New York and Tokyo! And I just love the pocket notebook to throw into my purse! Baublebar, oh Baublebar. How I love you. No really, if my growing collection of statement necklaces and earrings is any sign, I’m in love with this website. They have some of the most beautiful jewelry at such great prices! (Keep an eye out for a post all about Baublebar in the near future!) The Mini Bar Studs are so simple and a really great everyday earring. The Crystal Cleopatra Bib on the other hand, that’s anything but simple! I love the mix of crystals and chains, it’s gorgeous! Yep, another lipstick. I have a mini Kat Von D Everlasting Liquid Lipstick in Berlin and after trying it I knew I had to grab a few more from the line. They really do have great staying power! I have a habit of picking up the reds first so Outlaw is definitely my first choice. Truly, you can never have enough red lipsticks! When my sister and I visited New York this past December we stopped at the Jo Malone counter and tested a few scents. It’s hard to pick a favorite, but I fell in love with Vanilla & Anise. Fingers crossed I’ll be picking that up soon! Surprise, more florals! I’ve loved Cath Kidston ever since I lived in London. I keep hoping her stuff will be sold here in the States because those shipping costs are killing me! But I’m in desperate need for a new wallet and the Kingswood Rose wallet looks perfect! I’m a big fan of Jenn Im and she’s always sporting some amazing sunglasses. In particular the Frankie sunglasses by Quay Australia. I never used to like the round frames, but for some reason it’s all I wear now! The shape is surprisingly flattering! 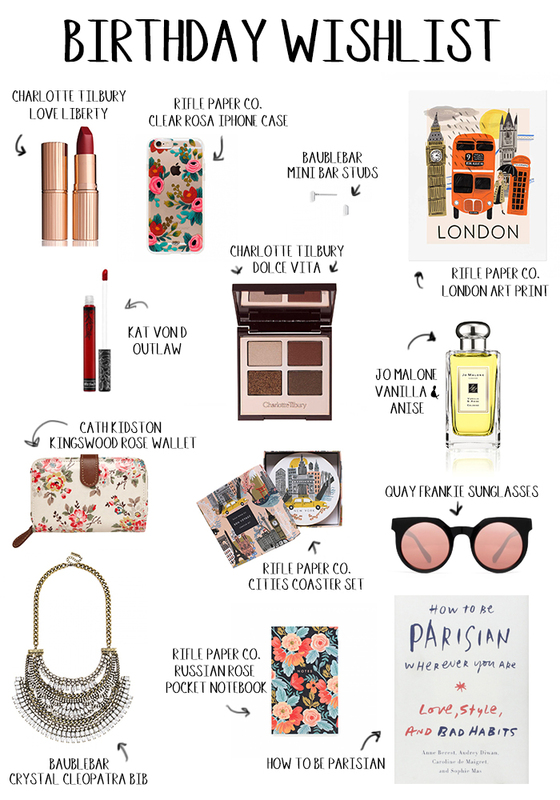 Lastly, a book that’s been all over the blogs lately, How To Be Parisian Wherever You Are. I’ve been fortunate enough to visit Paris twice now and I’ve just always been fascinated with Parisian life. This sounds like such a great read and I especially need a bit of advice on making my wardrobe a bit more Parisian! So what’s on your dream birthday wishlist? Well I hope you all had a lovely weekend! And I’ll see you on Tuesday! You created a lovely list :) I have the matte lipstick in Love Liberty and love it, also the Dolce Vita palette is a great choice! I think I saw Love Liberty on your site, it looks gorgeous on you! Fingers crossed I’ll get that palette someday, haha! Snap on every item you mentioned, I need cute new things in my life! That art print would look beautiful in a frame! Right?! That print is just so gorgeous and they have so many others I want too! I could start a gallery wall with just those, haha! It’s my birthday month too! Actually it is tomorrow, time goes by so fast! I loved the lipstick and palette, they are beautiful. Ah I hope you had a wonderful birthday! !